As data warehouses (DWs) and requirements for them continue to evolve, having a strategy to catch up and continuously modernize DWs is vital. 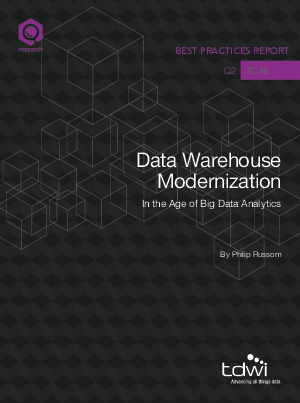 DWs continue to be relevant, since as they support operationalized analytics, and enable business value from machine data and other new forms of big data. This TDWI Best Practices report covers how to modernize a DW environment, to keep it competitive and aligned with business goals, in the new age of big data analytics.